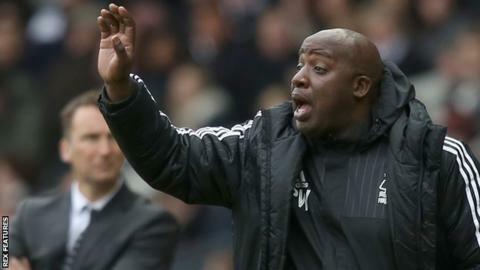 Paul Williams says he will not resign as Nottingham Forest head coach and has denied that chairman Fawaz Al Hasawi has been picking the team. Williams replaced Dougie Freedman as boss last month, but Forest have since slipped to 17th in the Championship table after losing three and drawing one of his four matches in charge. Williams told BBC Radio Nottingham talk of Fawaz interfering were "not true". "I can categorically say I have picked the team and tactics," Williams added. "Maybe the results haven't gone the way we would have liked, but it's been totally down to me. As staff we all discuss players and teams and how we will set up. But the final word is always down to me." And Williams said he had "no concerns" when asked if there was any truth in rumours he was close to quitting. You can see the interview with Paul Williams by clicking on the BBC Nottingham Sport Facebook page.